This specimen has no data associated with it. It was made available to the University of Texas High-Resolution X-ray CT Facility for scanning by Dr. Erik Seiffert of Stony Brook University. Funding for scanning was provided by a National Science Foundation grant (BCS-0114856) to Dr. Elwyn Simons of Duke University. Funding for image processing was provided by Dr. Timothy Rowe of The University of Texas at Austin. The specimen was scanned by Richard Ketcham on 4 February 2003 along the coronal axis for a total of 957 slices. Each 1024x1024 pixel slice is 0.07896 mm thick, with an interslice spacing of 0.07896 mm and a field of reconstruction of 70 mm. All endocast image processing by Dr. Ted Macrini, St. Mary's University. Click on the thumbnail to the left for a pitch animation (2.0 mb) of the Procavia cranial endocast highlighted in red within the skull, which is rendered semi-transparent. Click on the thumbnail to the left for a pitch animation (1.7 mb) of the isolated Procavia cranial endocast. Click on the thumbnail to the left for a roll animation (2.6 mb) of the Procavia cranial endocast highlighted in red within the skull, which is rendered semi-transparent. 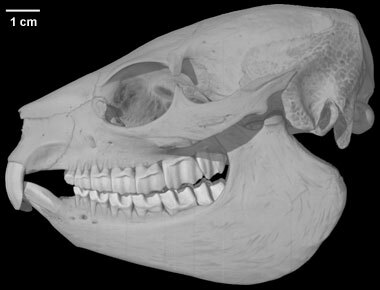 Click on the thumbnail to the left for a roll animation (1.8 mb) of the isolated Procavia cranial endocast. To cite this page: Dr. Erik Seiffert, 2011, "Procavia capensis" (On-line), Digital Morphology. Accessed April 25, 2019 at http://digimorph.org/specimens/Procavia_capensis/.